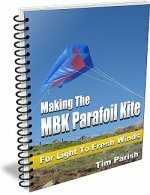 The second revision of the MBK Parafoil kite had recently been completed. It just so happened that the local kiting association's monthly fly day was coming up at the same time. With weather reports promising very pleasant conditions - if a little light - we duly turned up at the beach-side location. A smooth and fairly light breeze was coming from the north and two kites were already in the air... A large Peter Lynn 4-cell design and a small retail Bird kite. 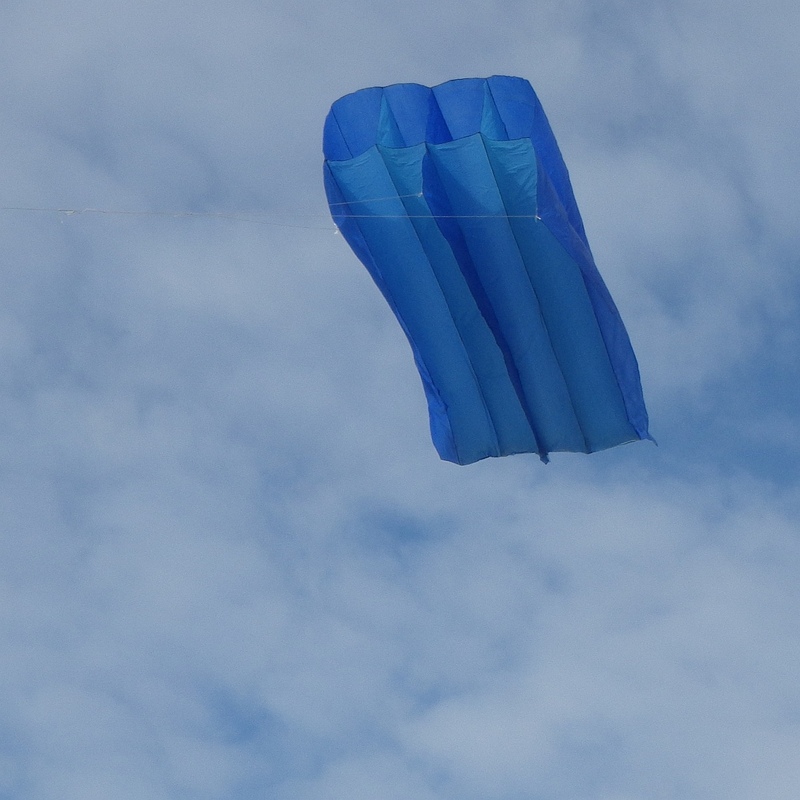 On a short 50 pound Dacron line, the two-tone blue plastic kite swished around from side to side but still managed to stay up. Long enough for a few still photos to be taken from various angles. So far so good! Space being limited on the grassy area, it was soon decided to add a drogue to the kite. The small orange windsock trailing behind kept the meanderings to a minimum as other kites were put up. Some more line was let out, before anchoring the kite to my carry-bag. Just a couple of loops though the handles sufficed to keep things under control. 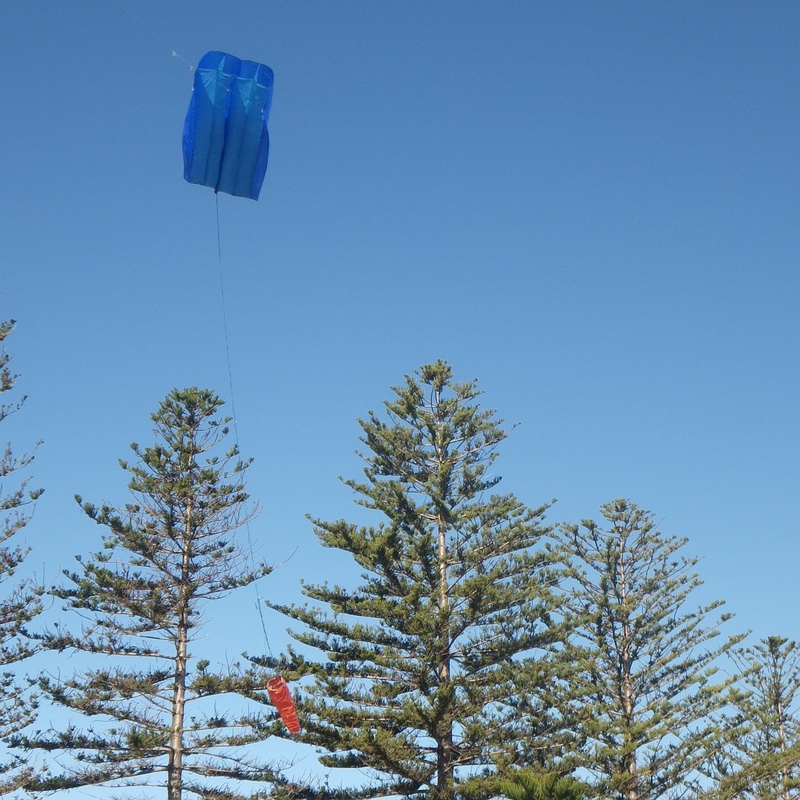 In the conditions, the kite was pulling quite gently despite being a 2-surface high-lift design. For a few minutes it was time to just sit back and observe plus get a video or two. Scampering over the nearby dunes brought a good angle, with the sun behind and a more interesting background than blue sky... Mainly tree-tops and houses further inland. Aren, my 10 year old son, was happily flying the Parasail on a shorter line. He found that grabbing the heavy wooden winder was much more comfortable than trying to hang on to the line itself. From the perspective of a child, the parachute-like Parasail pulls fiercely even in a gentle breeze! A couple of cells filled with air and then, suddenly, the much smaller blue parafoil was off. Floating up and away to one side from the larger kite. Whew! 'Nice skills' came a slightly tongue-in-cheek comment from another flier. It certainly had a funny side to it! The Parafoil twitched slowly from side to side as the rear portions of it's side keels flopped first one way and then the other. The drogue hung below, wagging occasionally about it's bridle knot. See the video up there. 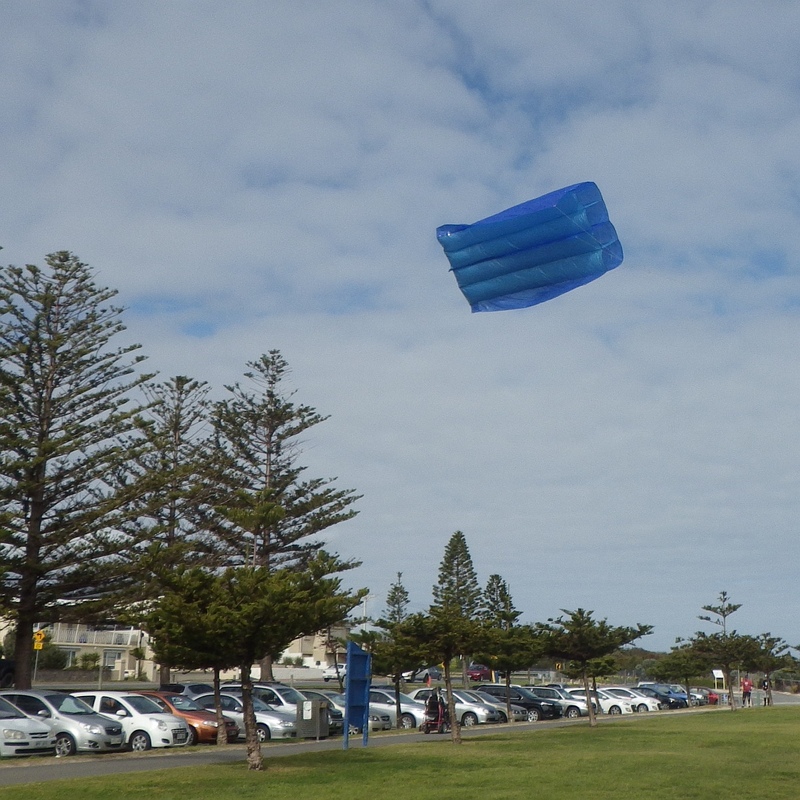 This scenario was very satisfying to me, since it proved the kite had a half-decent light-wind capability. A parafoil of all things! Plastic might be a humble sail material but it sure is light. It was a successful first outing for the new MBK Parafoil kite!